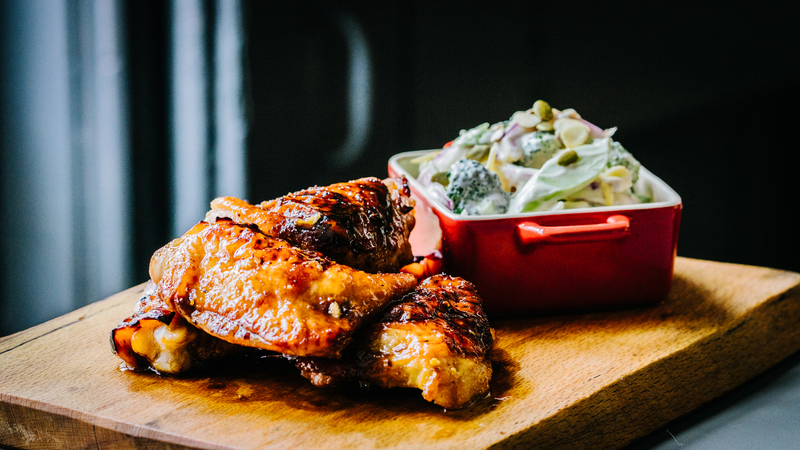 Try something new with Kevin Dundon's Honey and Ginger Chicken served with tasty broccoli slaw. 1. Preheat the oven to 200˚C /400˚F. In a large bowl, combine the honey, soy sauce, ground ginger, garlic, chilli flakes, salt, pepper and a dash of olive of oil. 2. Add the chicken thighs and combine to coat the chicken with the marinade. Leave to marinate for twenty minutes if you have time. 3. Transfer in a roasting tray and place in the oven and roast for 30-35 minutes until cooked through. 4. In the meantime, prepare the broccoli slaw. Trim the broccoli and cut it into large chunks. Chop the florets into smaller pieces. Peel the stem and then use a mandoline or a knife to cut them into thin slices. 5. Toss the sliced broccoli with the seed and nuts mix and red onion in a large bowl. Stir in the crème fraiche, mayonnaise and cider vinegar. 6. Check the seasoning and serve with the crispy chicken thighs.